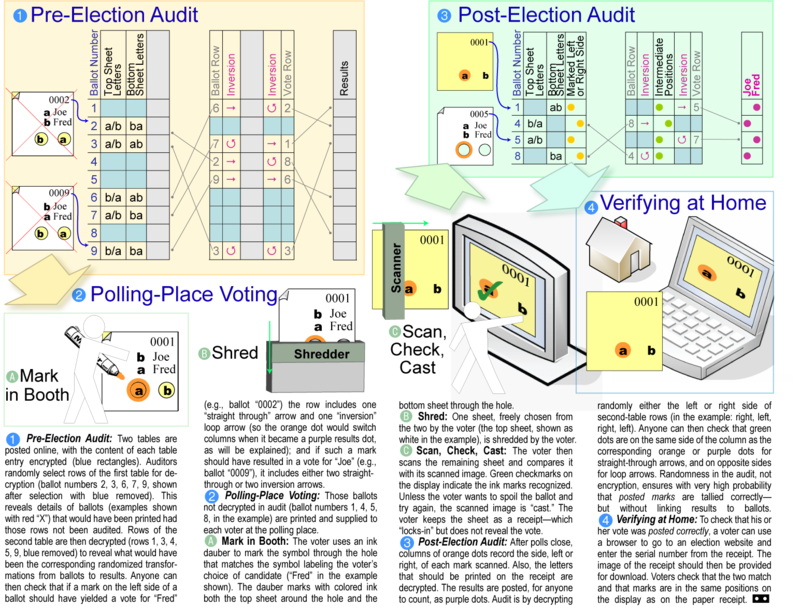 Punchscan is the first vote capture system to offer fully end-to-end (E2E) verifiability of election results. Punchscan moves beyond ordinary paper audit trails offering a far more robust and available way for voters to become involved in the election oversight process. What is E2E, and why is it Important? Verify that they have properly indicated their votes to election officials (cast-as-intended). Verify with extremely high assurance that all votes were counted properly (counted-as-cast). Voters can check that their vote actually made it to the tally, and that the election was conducted fairly. Punchscan is an international open-source project headed by esteemed cryptographer David Chaum and includes researchers from the University of Maryland-Baltimore County (UMBC), George Washington University (GWU), University of Ottawa (UO) and University of Waterloo (UW).